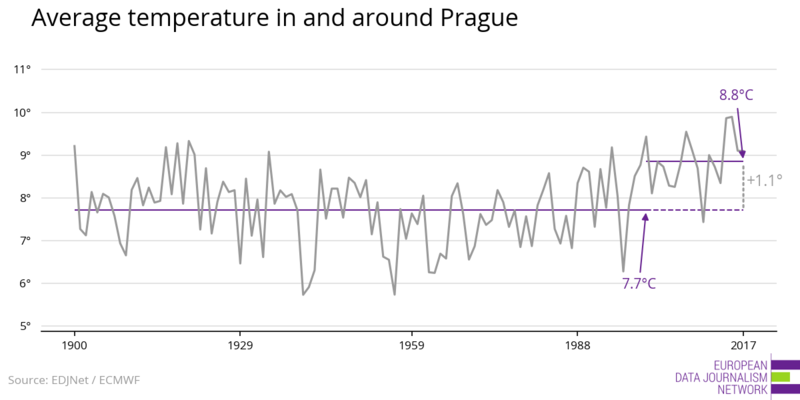 The temperature in and around Prague between 2000 and 2017 was 1.1°C above the 20th century average. The number of hot days (above 23°C over a 24-hour average) went from 1.2 days per year in the 20th century to 6.7 per year in the years since 2000. The number of freezing days (below −1°C over a 24-hour average) went from 51.8 days per year in the 20th century to 40.9 per year since 2000. 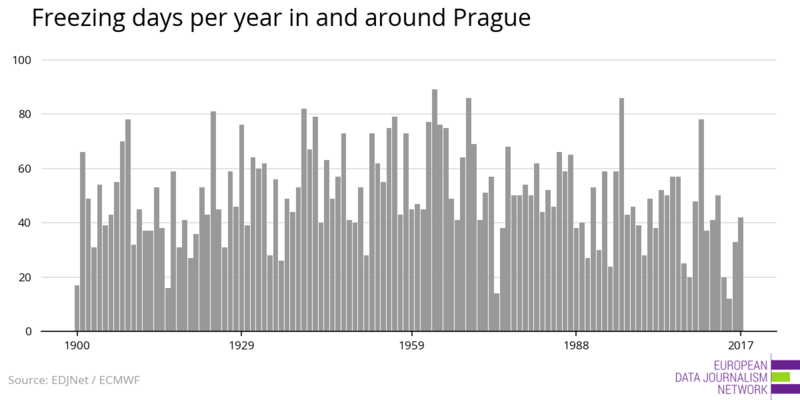 Since 1900, the average temperature in and around Prague increased from an average of 7.7°C between 1900 and 1999 to an average of 8.8°C between 2000 and 2017. 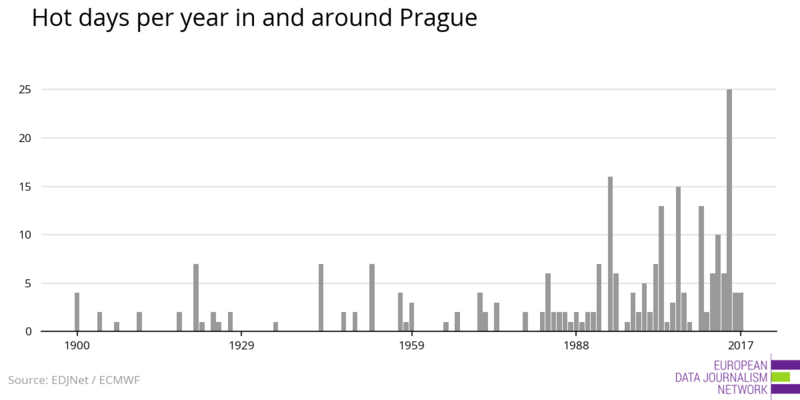 The warmest years in and around Prague were 2015, 2014, 2007, 2000, and 1920. In the 20th century, the average number of hot days (days for which the 24-hour average temperature is above 23°C) per year was 1.2. Between 2000 and 2017, the average number of hot days were 6.7 per year. A day is considered hot when its average temperature is over two standard deviations of the normal average. Temperature averaged −1°C or less for 51.8 days per year in the 20th century, on average. Between 2000 and 2017, the number of freezing days were 40.9 per year. What does it mean for Prague? Among the 58 biggest cities in the EU, Málaga and its environs is the fastest warming, and Prague ranks as number 17. We have defined “big cities” as cities with more than 500,000 people in the city proper. Prague is one of twelve locations in Czechia we have analyzed. This is how temperature has changed in the rest of them. We analyzed two data sets from the European Centre for Medium-Range Weather Forecasts (ECMWF), ERA-20C for the period 1900–1979 and ERA-interim for the period 1979–2017. Both data sets are re-analysis, which means that ECMWF scientists used observations from a variety of sources (satellite, weather stations, buoys, weather balloons) to estimate a series of variables for squares of about 80 kilometers in side width (125 kilometers for ERA-20C). While weather stations offer a much better record for immediate daily observations, using the ECMWF re-analyses is much more adequate for the study of long-term trends. Weather stations might move, or the city might expand around them, making their data unreliable when looking at centennial trends. However, the ECMWF data does not take into account micro-climates or “heat island” effects, so that the actual weather in the streets of Prague was probably one or two degrees warmer than the values reported here (the trend, however, is the same). This report was produced by the European Data Journalism Network. Partners include OBC Transeuropa (Italy), J++ (Sweden), Spiegel Online (Germany), Vox Europe (France), Pod Crto (Slovenia), Mobile Reporter (Belgium), Rue89 (France), Alternatives Economiques (France), and El Confidencial (Spain). de’Donato, Francesca K., et al. "Changes in the effect of heat on mortality in the last 20 years in nine European cities. Results from the PHASE project." International journal of environmental research and public health 12.12 (2015): 15567-15583. Michailidou, Alexandra V., Christos Vlachokostas, and Νicolas Moussiopoulos. "Interactions between climate change and the tourism sector: Multiple-criteria decision analysis to assess mitigation and adaptation options in tourism areas." Tourism Management 55 (2016): 1-12. Zeller, H., et al. "Mosquito‐borne disease surveillance by the European Centre for Disease Prevention and Control." Clinical microbiology and infection 19.8 (2013): 693-698.